(Enterprise,Oregon) – We’re happy to announce the continuation of our experimental beer program with our latest addition: Big Burn Imperial IPA. Originally we we’re set to brew this beer during the month of September- when the boys from Point Blank Distributing in Portland we’re scheduled to hang at the brewery for a couple days. Turned out that Mother Nature wasn’t quite up for that- as much of Wallowa County (and Eastern Oregon) was battling blazes from multiple wild fires. So after that was all over, and the flames we’re put out by our fearless and hardworking wildland fire crews- it was time to brew some beer- hence the name Big Burn Imperial IPA. With some huge aroma from Mosaic, Simcoe, and Citra hops, Production Manager/Brewer Josh Evans says, “Big Burn takes everything you love in an northwest style IPA and makes it’s bigger”. 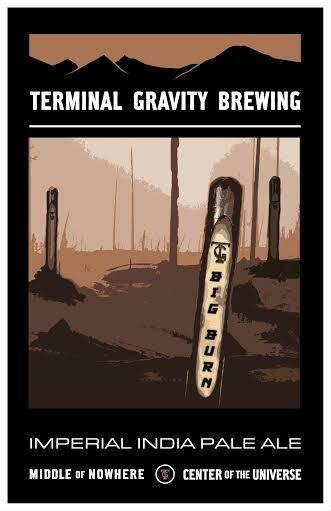 Coming in at 8.5% and a respectable 80 IBU’s, Big Burn is a remarkably drinkable beer that’s true to style. You can find Big Burn Imperial IPA in the finest taprooms and pubs in Portland, Bend, SW Washington, Seattle, and Eastern Oregon. Founded in 1997, Terminal Gravity Brewing Company sits in the foothills of the Wallowa Mountains in Enterprise, Oregon. TG first entered the Oregon beer market with its TG IPA and quickly changed the beer scene in Oregon in the late 90’s. Since than, TG has continued to be a part of the growing craft beer movement in the Northwest. With a wide selection of bottled beers, draught varieties, and seasonal specialties, Terminal Gravity Brewing distributes its beer in Oregon, Washington, Idaho, and Hawaii.